Today was another beautiful sunny spring day in north Alabama. It has rained a lot this past week, the gray skies making our moods even gloomier. The low last night was a chilly 39 degrees but with the sunshine it warmed up quickly today. There was some scattered frost around but none at our house so no damage to plants yet. 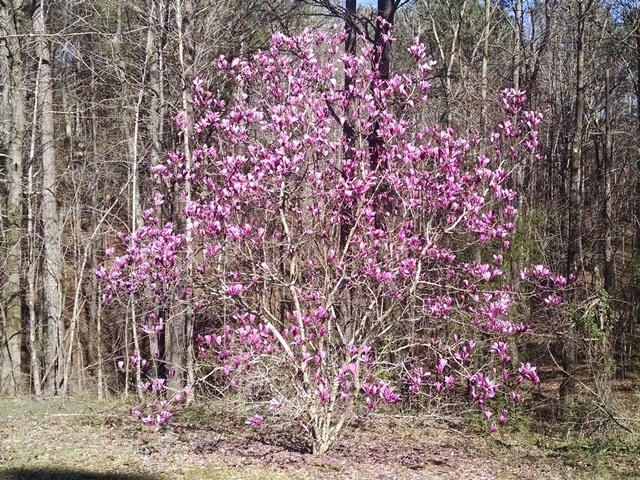 Our tulip magnolia still looks great. It will be in the 30s again tonight but tomorrow is supposed to be another beautiful day. Sorry we left you hanging all week. It was a very difficult week for us on all sorts of levels. Aunt Helen has been such an independent lady all her life and she is not happy about needing assistance since she has basically loss the use of her right arm for 4-6 weeks and possibly 8-10 weeks while her clavicle fracture heals. She actually has required minimal pain medications, but the dementia just makes everything so difficult. She forgets she is not supposed to be moving the arm and that she must not take the splint off. Somehow she manages to get out of it if you look away for just a second. She forgets her clavicle is broken. She forgets where she is and on and on. She frequently is pitiful, homesick, and scared. So very sad. We were told by two doctors that she must go to a skilled nursing facility for rehab instead of back home. We spent every day this week at the hospital with her or visiting rehab facilities. By the time we got home in the evenings we were just to tired to prepare a blog post. Dealing with the hospital and insurance company all week was exhausting. We were able to finally get Helen transferred to a rehab facility in Oneonta, 15 minutes from our house, last night. We were discharged at 5:15 just in time for the worst of the rush hour traffic. This center seems to be a good fit for Helen and we are very hopeful all will be okay. She, of course, only wants to go home NOW. Very difficult decisions lie ahead. We need your prayers for wisdom and courage. The good news is that Helen had some good times today. She enjoyed Bible study this morning and really had a good time at a gospel singing this afternoon. She also got to meet the facility cat, Lucy. Lucy enjoyed Helen’s petting. Helen also seemed to enjoyed meeting the other people at rehab. Praying good times continue for her. Good news for us is that it appears we are going to be able to get back to the mission work God has called us to with the help of some cousins and Helen’s church family that have volunteered to help care for her while we are gone. We know we are the hands and feet of God in all that we do, including helping care for Helen, but we also know we are called to be helping the victims of flooding last year in Baton Rouge. When all of Gods people answer their call all of God’s work gets done. Hopefully, by the middle of the week we will be in Baton Rouge preparing for the start of the NOMADS disaster rebuilding project there. But as always, we will remain flexible. Also hopefully, we will now be back to daily blogging and will soon have some more interesting and uplifting items and pictures to share with you. Remember, we all need to be in prayer for our worship services tomorrow and that God prepare our hearts to receive the message He has for us. Hope you had a great week and a restful and enjoyable weekend.